A series of scholarships established in the name of Army Capt. Gregory T. Dalessio ’00/M.A. ’04, who died while on duty in Iraq, allow his spirit of generosity to live on. Had Army Capt. Gregory T. Dalessio ’00/M.A. ’04 returned from the war in Iraq, would he have pursued a career in diplomacy? Or would he have become a social worker or a teacher — or even a priest? He had considered all these possibilities. One thing is clear: Dalessio was a special person. The decorated soldier earned his master’s degree at Seton Hall’s School of Diplomacy and International Relations. As a civil affairs officer, he was trying to help democracy take root in war-torn Iraq when he was killed there in 2008, protecting his superior officer. His death came not long after he attended the dedication of a new park and playground for Iraqi children. Dalessio was awarded the Purple Heart and Bronze Star medals for bravery posthumously. 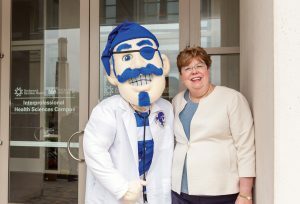 To honor his memory at Seton Hall, his family established two scholarships in his name at the School of Diplomacy. Created several years apart, the scholarships were designed to help students like Dalessio who exemplify qualities of servant leadership. Pagano tells a story that reveals Dalessio’s character: As a college freshman, he got a summer job working on a landscaping crew — making significant money for a teenager. But the young man insisted: “ ‘I really don’t like this job. I’m not relating to anybody,’ ” Pagano says. Instead, Dalessio went to work at a summer camp for a local chapter of the Arc of New Jersey, an association that helps people with special needs, earning a fraction of his landscaping pay. “ ‘It’s what I want to do. It’s helping people,’” Pagano remembers him saying. Each of the Capt. Gregory T. Dalessio Memorial Scholarships keeps alive Dalessio’s inclination to help others. An annual scholarship was initiated when Dalessio’s youngest brother, Tim, came up with the idea for a 5K road race that would honor the values his big brother embodied. Held on the first Saturday of December, the event is well attended by the Seton Hall community; the ROTC unit — of which Dalessio was once a part — runs in cadence, says his mother, Maureen Pagano. The first year’s race supported The ONE Campaign, which sponsors food relief work in Africa and is affiliated with U2, a rock band Dalessio loved. 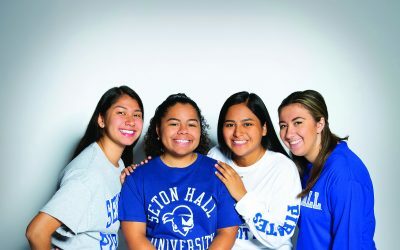 The second year, the family launched the annual Seton Hall scholarship with funds from the race. Seeing the impact the annual scholarship has made for students led Dalessio’s family and friends to establish an endowed scholarship in 2014, which will help prepare diplomacy students in perpetuity for careers in global leadership where they can foster positive change. Because of his deep compassion and spirituality, Dalessio had a strong effect on people, sometimes profound, says one of his boyhood friends, John March, who began his priestly formation at Immaculate Conception Seminary this fall.